Typically, a local moving company gets its start with two guys and a truck. But in the age of mobile apps and sharing economies, Zootly ramped up quickly. The New York City mover launched last year and already boasts a fleet of 366 vehicles. Zootly CEO George Colwell says the business plan was inspired by a frustrating experience. Co-founder Rudy Callegari wanted to move a blue couch across town from his apartment to his brother’s office. Every moving company he called quoted him a price based on a 3-4 hour minimum commitment. “He just needed a few guys for an hour,” Colwell says. “There was no quick-and-easy way to get something from point A to point B.” He imagined how many moving vans were sitting idle around the city, waiting for a 4-hour residential moving job while he struggled to find someone to move his couch. 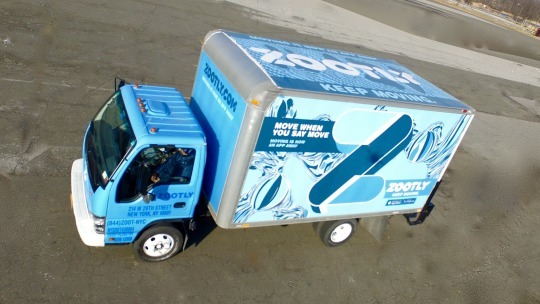 By partnering with more than 40 reputable movers and offering their services through an app, Zootly has set out to help moving companies maximize use of their vehicles while helping customers get jobs done more easily. “Our biggest challenge is the fact that we are teaching consumers a new way to do something they’ve traditionally found workarounds for,” Colwell says. “We will ultimately teach people … that any time you’re moving something bulky you don’t need to be trapped by other people’s delivery schedules." Getting a dining set back to your fifth floor walkup from the Chelsea flea market, grabbing a desk from a Brooklyn firesale for your startup’s Silicon Alley office, or giving your spare sleigh bed to your nephew in Queens shouldn’t require calling up a friend in the suburbs with a truck or waiting a month for a moving company. The Zootly mobile app lets customers book a move instantly, pay online for a metered hourly service ($149 for the first hour and $99 for each additional hour, prorated for under a full hour), and track the move through the app’s GPS. Colwell says more than 500 moving companies are registered with the New York City Department of Transportation. "A national chain like Best Buy would not do deals with 500 mom and pop local delivery companies,” he says. “But if you aggregate and come at them with one brand – Zootly,” then small movers could see more business, he says. To vet potential partners, Zootly retained a risk management business to create an automated system for checking reviews on Yelp, Google, Angie’s List, DOT, and the Better Business Bureau as well as for running background checks on business leadership. Colwell estimates that only about 130 of the 500 existing NYC movers have customer service and quality control that meets Zootly’s partnership standards.